There comes a stage in a choreographer’s life when he/ she apart from the world of movements has to enter the world of words. These words led me to become aware of the value of articulating your thoughts through text. I became conscious of the fact that proposals, write-ups on your work, blogs, reviews, press release, introductions etc. are all as important as dancing itself. I began the study of work documentation 3 years ago for Nritarutya and in turn got absorbed into the study of choreography. I realised that this study gives me very interesting insight into the choreographer’s personality. I felt that every choreographer has fascinating truth on creation and imagination, which permeates into their very existence. In this chapter I introduce to you, Mayuri- the choreographer and her process. One could say Mayuri’s work is spiritual, stylised, symbollic, inspired by iconography and sophisticated in nature. Many of her works are drawn from the mythological and folk traditions of India and some from her love for animals. Her technique is highly influenced by the classical and folk dances of India. 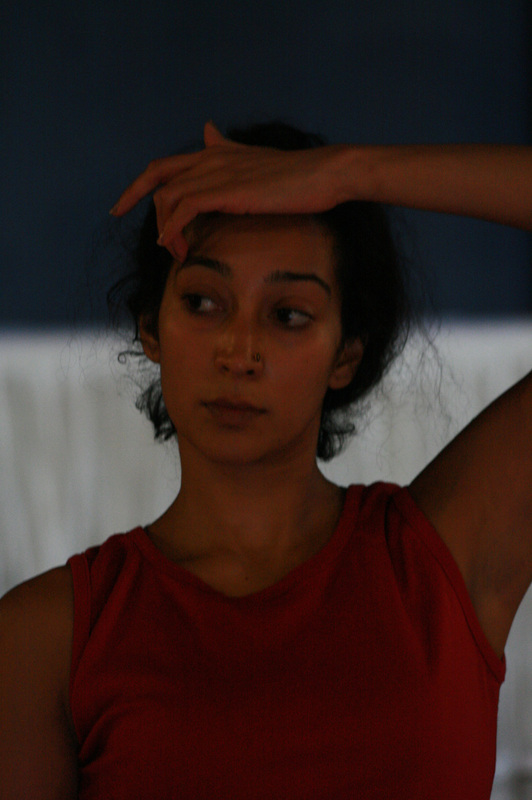 She also uses modern dance techniques to give her ideas-movement, levels and agility. Her choreography process begins with research on the history, popular myths attached, interesting trivia, iconography, cultural context and relevance of it in modern India. After this, her research on movement techniques begins for which she travels to different parts of the country. On completion of research on theory and movement, she spends hours on the drawing board doing her homework on space division, movements, costume, lights and music. She is inspired by unusual earthy Indian sounds and the reverberating sounds of Africa. Her styling is minimalistic always highlighting one particular element in her design or accessories. Her research leads her to a very definite picture of the final outcome after which she sculpts the dance production methodically. At this point, it would be wrong for me not to mention Mayuri’s interesting chemistry with space!! Although the stage is a platform with 4 corners, she feels that it is like a magician with his wand. 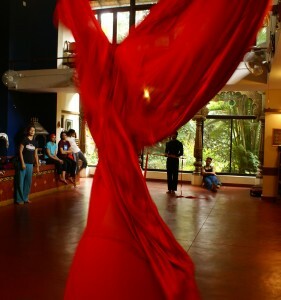 She says that a choreographer hands over the dance to a space, while she watches their union during the performance. This kind of explains how she manages to visualize so elaborately along x and y quadrants. When the idea comes to the level of execution, the unfolding starts off with training for dancers. They are subjected to a series of classes and workshops on the techniques and the style of movement she will be using. Meanwhile there is a lot of theoretical information on the content provided to the dancers to comprehend the essence of her creation. Mayuri believes that “every movement” has a style and attitude, which she uses for her symmetrical or non-symmetrical compositions. An interesting trait of Mayuri is the way she brilliantly uses stillness in her movements bringing out the potential energy of a form. 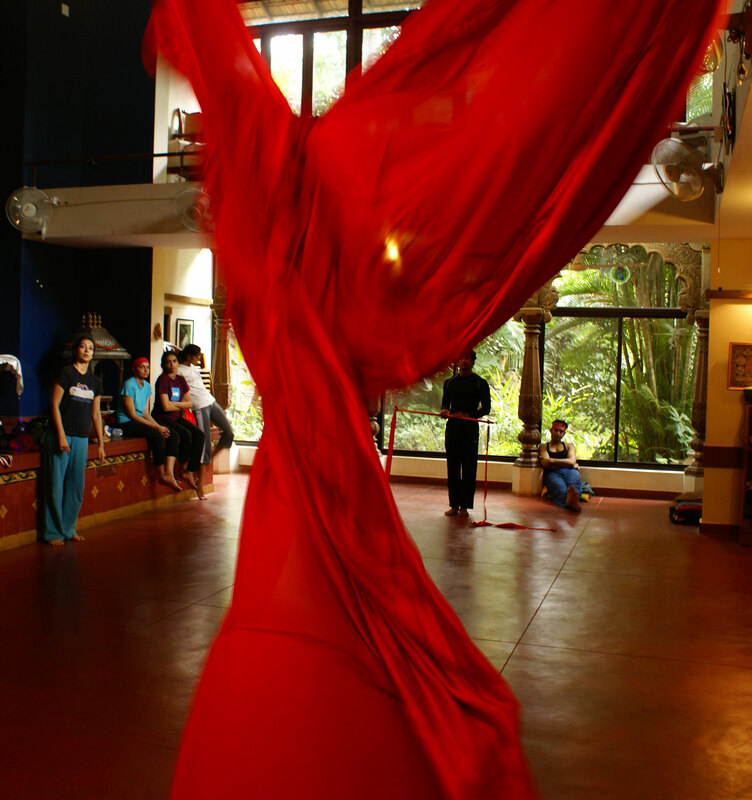 The final stage and major part of the creative process involves polishing the dance. Lasting for a minimum period of 3 months this is done in stages starting from steps, sections of dance, entire dance and finally, the complete production. Out’ comes the diary everyday for the dancers to note down each and every correction on their performance. “Do your home work and come to rehearsals”, “Work as a team”, “Give it your best shot”, “We’ve all come here to dance”, “Where is the punch?” are all Mayuri at her typical self. This process continues to…perfection!!! I could go on for pages on Mayuri and her work, but have kept it short for now. In my next blog, I will write about our fitness freak choreographer, Sathya. nice to get a peek at an artist’s creative process. Looking forward to the next one. Cheers! Thats great Mayuri. I being a coreographer myself realize how essential it is to be systematic and purposeful. Keep up the good work. i still remember watching mayuri an are team practicing on the stage at CKP … cant forget those visuals so colorful and vibrant ! !